Based on the count of Prius and similar vehicles we see arriving at Lapland Lake, we know our customer base cares about sustainable behavior. Human powered activities such as canoeing, kayaking, hiking, and biking in the summer and cross country skiing and snowshoeing in the winter fit with this theme. Here is a quick update on a few small things we are doing in this area. We are focusing on win-win projects where “green” changes also enhance the quality of our guest experiences. 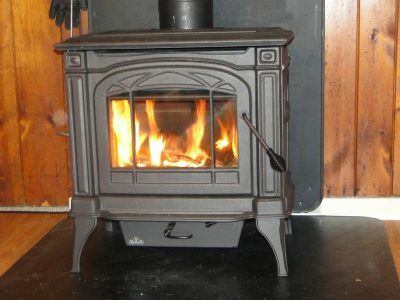 New woodstove in Ruska Tupa has a two stage combustion design to provide improved efficiency and reduced particulate emissions. Plus it has a beautiful glass window, photo above. We will evaluate this unit over the coming 2015-2016 winter. If it works as we expect will be upgrading more stoves. High efficiency replacement windows for second floor of Lapin Tupa. Individual room wall mounted thermostats for electric baseboard heat (6 of 10 Tupas complete, planning to complete remainder before winter). These make it easier for our guests to adjust heat to the desired level without overuse. Energy conservation, lighting – our existing interior lighting in Tupas is a mix of incandescent and compact fluorescent. As bulbs need replacement, we are converting to LED lighting. This offers the best combination of energy efficiency and comfortable light color.